Club Penguin Cheats by Mimo777 Club Penguin Cheats by Mimo777: This Weeks Club Penguin Reviewed By You! "The ultimate furniture item would be a flying carpet!!!! When you walk over it, it would rise up and fly around your igloo! That would be so awesome!!!!!! And you could pick the color and pattern!!! Haha- A penguin can dream of flying in the own comfort of its home, can't it? You rock Club Penguin! Waddle on!" Wow, Yodalaheehoo, what a great idea! If you want to write a Reviewed By You, Club Penguin wants to know what your favorite way to help out when something like the rockslide in the Mine happens on the island? Do you like jackhammering? Supervising penguins? Bringing pizzas around? Or something else? Let Club Penguin know. Let me know how you like to help out, too, k? Cool! it would be so fun!!!! Not a flying carpet, a flying puffle! (Not a black puffle on fire) It could make you fly around the island and would cost 1600 coins. Awesome! it would be kool to fly around. too bad it would be only fer members. The was an awesome review! I can't remember your name but well done! A flying carpet would be seriously awesome!! You're rite, cp shud make some gud thing for non-mems. i always feel left out when a new kool mem stuff is out and every1 talks about it. mimo theres a leek in the udergrowend pool! Hey. Toys R Us fixed the brown puffle page. it now says black. Okay everyone!!! Very important news!!! I know many of you have heard of the CPG10, and would like to join, but we are CAPPING OFF the number of members at 12. These spots are already filled, so the CPG12 is now FULL! We don't intend to be mean, but we have to do it... Thank You. in the picture it looks like a brown puffle is in the background. heyy...what do you think about a jet pack and you can fly around with it! That is a great idea! Well done that person. P.S. This flying carpet sounds so awesome! cool it would be so fun and even better, if you could fly round club penguin. Now who would have thought of that? 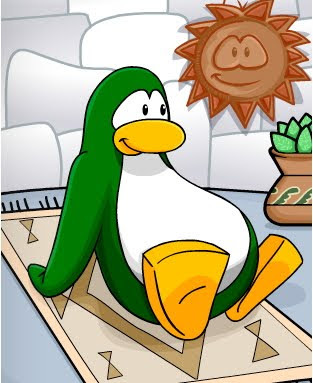 Hopefully Clubpenguin took thought of this penguins idea! Sorry I haven't been modding, remember I can't on the weekdays? Well i got my moms permission today! YES!! If you ever make it to one of his parties yes! Sometimes he even has surprise quickee parties! Be on his site enough and you might even go to one! They R Right Its Gone! I am doing a contest! Snow machine! Make it sonow in the summer! Am I a part of it? Because I wrote a comment about it but I don't know if you saw it. cool but hey mimo wanna tell us where the new pin is? Got it! Wait we are the CPG12 now? Who joined? I'd luv to know! Ooooo...Mimo can only add you if you are a Mimo Mod. Gotta keep trying! Cool it would be fun! I like to bring cake to the other workers. When I take a break I like to cart surf and swing by the Pizza Palor. It is fun to see the smiles on their faces. The Mine is also a great place to share your ideas about what will happen after the rockslide clears up. Also it would be cool if you could fly around Club Penguin to. Ya! That would be so cool! The pin is the puffer fish at the iceberg. Everyone thinks he's awesome. But you can only be a mimo mod or mega mimo mod to be a buddy with mimo. Well first, you have to be on the list to be added. Second you have to be on the mimo mod spot or mega mimo mod or top mod to be his buddy. We DON'T INTEND TO BE MEAN, but WE HAVE TO DO IT! We are VERY SORRY, and if you don't like us, we are sorry!